Quantum Limit.com: The Space RACE Is On! But, I suppose there is a real case to be made that perhaps we can learn even more. And it is also true the Magellan focused on the Venusian surface details and not her atmosphere. But I still smell a hidden agenda is afoot with the new ESA probe. One of the reasons for that is the absurd notion that if we could discover what triggered the Venus greenhouse effect (which is widely believed to be its planetary volcanism), then mankind could do something about it if it started happening on earth. While humans spew forth millions of tons of carbon dioxide into our atmosphere every year – a single small volcano would eject hundreds of times that amount into the atmosphere in a single day! If the God of all creation decides to fill us up with CO2 then it’s going to happen whether we like it or not. To justify a space mission based on the God-like notion that we are going to save our planet by some human control is preposterous and even smacks of a kind of imperial interplanetary fascism. Let me see now – we can convene a meeting of the European Union and the Ministers can set up a plan to plug Mount Vesuvius during her next eruption. This I have to see! Wait - there is yet another possibility. Perhaps Venus Express will peer down thorugh the clouds and see a long dead civlilzation with countless billions of SUV's littering the surface of Venus - the long awaited smoking gun! 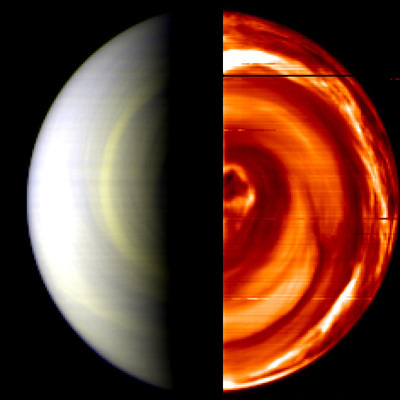 So what’s the real reason for the Venus Express probe? They slipped and told everyone in their latest news release. They said, “With the arrival of Venus Express, ESA is the only space agency to have science operations under way around four planets: Venus, the Moon, Mars and Saturn” underlines Professor David Southwood, the Director of ESA’s science programmes. “We are really proud to deliver such a capability to the international science community.” Ahhh – international competition is alive and well after all! The underlying message here is this, "The European Union is not only a player in interplanetary power - they are, in fact, the leaders of the earth's contingent!" Fine. At lease we now know that the Europeans are up to. As far as I’m concerned, that’s the best of all reasons to explore space anyway! Good job ESA! Keep flying! We need some more of those press releases to engender some real international jealousy and to keep the space ball rolling. And as far as the earthly volcano problems- I suggest a really big cork and some brave team to climb the mountain and shove it in. Come on guys – you must be able to come up with better justifications for your competitions in the future. Let's go ahead and play the game - but you guys get a failing grade in coming up with really good reasons to justify your expeditions.